H x W: 39.5 in. / 29.5 in. General Kjellstrom was President of The Army and Navy Club from 1980-1983. He was responsible for saving the Club from financial difficulty and planning for its future, including the Club building reconstruction between 1984 and 1987. He designed the third-floor library around his vision for the future of the Club. A member of the Quartermaster Hall of Fame, he served with the 76th Infantry Division in World War II, the Logistical Command in Japan during the Korean War, and commanded the 14th Inventory Control Center in Saigon and Long Bien, Vietnam. 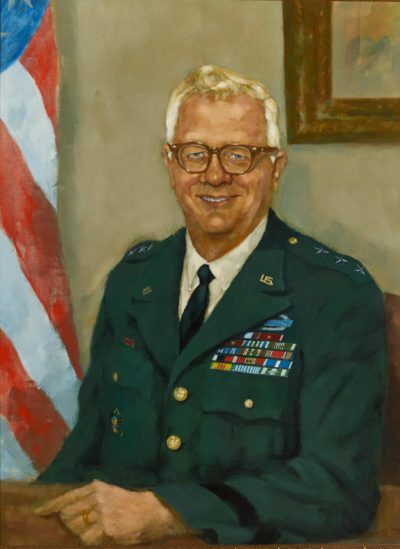 He later served as the Director of the Army Budget and then as Comptroller of the Army, the first Quartermaster officer to serve in either position. His last visit to the Club was the occasion of his receiving the Army and Navy Club Distinguished Service Award in 2010.